The story on a whole though was fun, and I can't wait to see where Dave and gang go from here! A book of pigsFirst if all, I enjoyed the story. Good flow, good development, right in line with the other books of this series.Snort, snorting, snorted...The author, in my opinion, needs some variation from those descriptions of people's actions. There's enough of that happening, snorting that is, that it distracts me from what's happening. End of a quest start of another More undead! Plus the addition of giant spiders! More fights for the stone raiders. David finally starts leveling up, he just needs to watch out for those pesky walls. Strong seriesThis series has strongly drawn me in. Well-written with some editing errors, but with witty, strong characters, good world-building and continuous short and long-term plots which keep one's interest. This series is Science Fiction wrapped in Fantasy. Great character development. Very enjoyable. I've read every book of this series. I've read them very fast because of how good they are. I've bought the whole series. 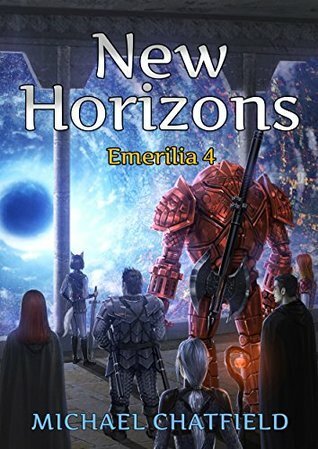 Another great Emerilia storyI'm loving this series so far. I just binge read the first 4 and onto the next. These are great LitRPG stories with leveling and crafting and adventuring and raiding! 3 stars, Pretty good, If you like the first 3 books this one is pretty much the same. Well craftedThis volume is well put together. Some Stargate, some skyrim, a wonderful cast of memorable characters. I'm binge reading them all. Awesome!Great series! I love the blend of sci-fi and fantasy. Would recommend to anyone. The characters are fleshed out and feel like real people. This book was well written just like the others. Good addition!Great addition to the series. I really enjoy dropping in on this world and it's people. Keep it up! Great work! More of the same as far as issues with consistency goes, but a good story nonetheless. This book was a good continuation of both story and characters looking forward to the next book when it is available on audio. loved every book so far in this series. didn't have to wait long for this book so I hope the next one would be available soon. the story has evolved nicely. The big fight is near. Good read. A LitRPG story. The story mainly focuses on the Aleph and helping them out for their return to the world.